Grays Harbor PUD commissioners have agreed to officially end the district's involvement in the Radar Ridge wind energy consortium later this summer, but they still authorized an additional $125,000 for ongoing environmental work to keep the project moving forward until then. The three commissioners voted unanimously in a special meeting Tuesday to direct project developer Energy Northwest to market Grays Harbor's 49 percent share of the project to other potential investors, stating the PUD "intends to cease our participation." But in a spilt 2-1 vote, the commissioners reversed an earlier no-action decision and agreed to pay for continued studies on the northern goshawk and a special radar study -- known as Merlin -- designed to measure the impact the wind turbines would have on marbled murrelets, an endangered species of seabird. Commissioner Tom Casey proposed paying for the additional environmental review after Energy Northwest sent a formal request to the PUD with a deadline for a final decision along with supporting documents outlining what the money would be used for. Casey and Commissioner Truman Seely, who also voted for the additional funding, said it was the intent of Grays Harbor to keep the project attractive so the other partners could either assume Grays Harbor's share or potentially sell it to another interested participant. "We're not the only ones in the boat that we're shooting a hole in the bottom of," Casey said of the decision to pull out of the project but keep funding the ongoing studies at the same time. He could not predict, however, whether Grays Harbor would be able to recover those costs. "It is risky. I'm not going to sugarcoat that at all," Casey said. Commissioner Russ Skolrood voted against that proposal, saying he believes the risks of allocating additional funds outweighed the potential for recouping previous investments. The additional money is part of a $256,000 budget amendment proposed by Energy Northwest to be funded by the four Public Utility Districts participating in the project: Grays Harbor, Clallam County No. 1, Mason County No. 3 and Pacific County No. 2. Grays Harbor already has invested about $845,000 in the pre-construction phase of the project, to be located in Pacific County near Naselle. "When we began this process, the project looked like a good investment. But as we face a longer, more costly permitting process, we believe it is in the best interest of ratepayers to seek another entity to assume our share of the project and recoup as much of our investment as possible," PUD Manager Rick Lovely said. 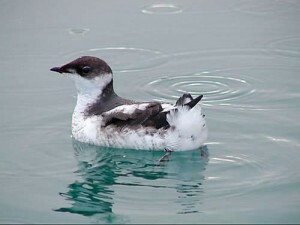 Lovely questioned spending the additional money, and two representatives of environmental groups also urged commissioners to completely abandon the project based on the potential impact to marbled murrelet habitat. "Here we are, all this time later, being requested to put in another million or $125,000 and to fund all those things necessary for an EIS (environmental impact statement)," Lovely said. "To me, in some respects, we're hearing the same comments from Energy Northwest: This is no problem, all our ducks are in a row, everything is lined up and the science will carry the day. . . . We're being asked to put a lot of money into a facility now that now has very questionable ability to get the permits and very questionable ability to extend the lease." "It's going to cost our ratepayers a lot of money," Lovely added. Kate Gehret, an associate with the Seattle law firm Perkins Coie, urged commissioners to pull out of the project entirely. Representing a consortium of environmental groups opposed to the Radar Ridge site, Gehret warned the project would face continued challenge even if the permits are granted by state and federal agencies that must approve the location, which is owned by the state Department of Natural Resources. The area should be preserved to help the species of murrelets recover, she said, and not used for development. "Considering the uncertainty and the controversy surrounding this project, the (PUD commissioners) acted responsibly by deciding not to spend additional public funds," she said of the decision last week to withhold any additional money. But Casey said he felt a sense of obligation to the other project partners and did not want to do anything that would hinder the opportunity for them to move forward if they choose to continue. Approving the additional funds buys the other PUDs time to consider whether to pick up Grays Harbor's portion or to explore other options. "They've gone into an agreement with us in good faith," Casey said. In casting the deciding vote in favor of the additional money, Seely stated emphatically that the commissioners were not endorsing any other cost overruns already attached to the project's budget – of which Grays Harbor could be assessed another $440,000. Casey also clarified that he was only referring to the $125,000 in his motion to approve the funds. "Part of the reason we're here all these months after the first of the year is that when Energy Northwest spent money, the participants were left out of the process. And all of the money that was previously agreed to has been spent," Lovely said. Energy Northwest originally asked Grays Harbor to pay a proposed budget increase of $1.14 million, but then scaled back the request to pay for work already under way as part of the formal process toward completing a environmental impact statement. "We hope this funding will enhance the possibility that Energy Northwest will be able to find a replacement for us," Lovely said in a statement after the meeting. State Sen. Tim Sheldon, D-Potlach, attended the meeting as a member of Energy Northwest's board of directors, and said he believed there would be buyers willing to pick up Grays Harbor's share despite the potential hurdles the project still faces. "This is certainly going to raise concerns, but I appreciate the deliberations the Grays Harbor PUD has made," Sheldon said. "I'll bring that back to the executive board and try to express my reading of their feelings." He noted that Energy Northwest previously had success in marketing shares of the Mustang Ridge wind energy project in Eastern Washington. "It would not be out of the ordinary for Energy Northwest to find a new participant," Sheldon said. "It really is a wonderful site, and I think it still has great potential for wind on the west side of the mountains." The project also makes sense economically, Sheldon said: "Certainly, it is a huge economic development project in Pacific County, with an estimated $200 million in investment in a county that is struggling like a lot of rural counties."